This is the story of Jack B. Schneider, Our Hero. Jack was a wonderful man that was loved, is missed, and will always be cherished. He was an amazing husband, father, grandfather and great grandfather. He was a follower of Christ and lived his life showing unconditional love for all he touched. He was a friend to everyone he met and known for his warm heart and helpfulness. 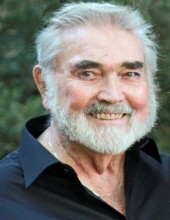 He truly made his mark during his ninety-one years and will be remembered by all. .
Jack was born John Edward Brown III on August 14, 1927 in South Portland, Maine and went to meet his Lord peacefully on February 13, 2019 in The Woodlands, Texas surrounded by his family. He was predeceased by his parents, John Edward Brown II and Vivian Brothers, and his foster parents, Henry and Josephine Schneider. He will be missed dearly by his wife of sixty-eight years, Ruth, and his four children, Jacki Guerrero and husband Gilbert, Steve Schneider, Mark Schneider and Torin Beatty. He left behind thirteen grandchildren, two step-grandchildren, twenty-five great grandchildren, many step-great grandchildren, their spouses, and one soon to be born great, great grandchild. Together he and his sweetheart created quite a legacy and wonderful memories through this beloved family. Jack and Ruth got married on December 15, 1950 in Fontana, California. They spent the early part of their marriage traveling the world with their four children as Jack served his country in the United States Air Force. Jack was a twenty-year veteran, serving in WWII and the Korean and Vietnam wars. He ended his service in California and lived there for over fifty years until moving to Texas in 2012. He was a devoted member of The Woodlands United Methodist Church where he worshiped regularly with his family. He was an active member of the local Kiwanis and VFW. He was always volunteering and serving others along with his beloved wife and children. He was truly a servant at heart. Jack will be honored with a well-deserved military memorial service on Friday, April 26, 2019 at 10:30 a.m. at the Houston National Cemetery, 10410 Veterans Memorial Drive, Houston. The following day Saturday, April 27, 2019 at 10:00 a.m. his family and friends will gather at The Woodlands United Methodist Church, 2200 Lake Woodlands Drive, The Woodlands, to celebrate the life of this beloved man. (http://www.woodlandskiwanis.com/sponsor-our-charities/). He will smile for either. To plant a tree in memory of Jack B. Schneider, please visit our Tribute Store. "Email Address" would like to share the life celebration of Jack B. Schneider. Click on the "link" to go to share a favorite memory or leave a condolence message for the family.